A bunch of banalities follow. Fun and challenge. No need to dream for upcoming spring time - bike right away! Snow makes dirt freeze/disappear. A bike comes out much cleaner after a ride. 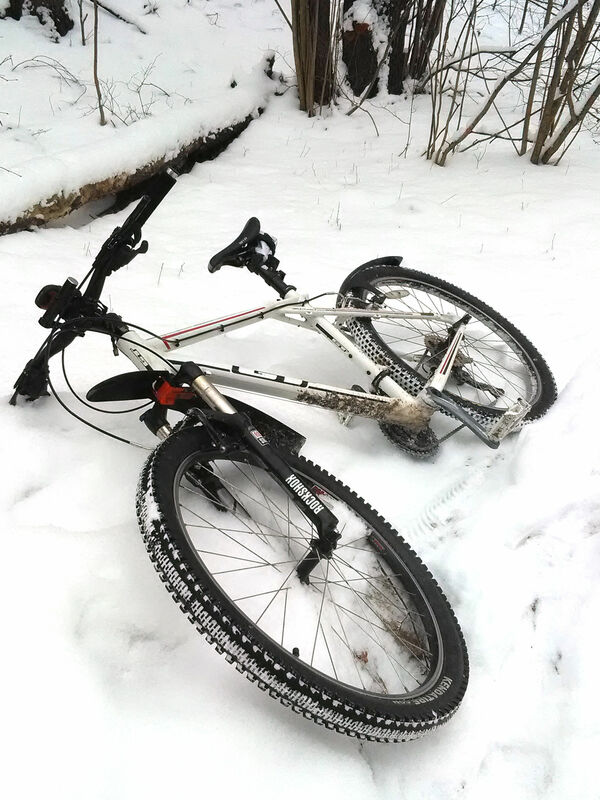 One only has to be careful to not bring much of the snow stuck to the bike inside, where it will melt and create a mess. It is less painful to fall from your steed as snow makes a good cushion. It is cold. One has to be prepared to endure some of it, and wear clothes appropriate for the particular temperature range. I tend to differentiate conditions in these groups: 5 °C – 0 °C; 0 °C – -5 °C; -5 °C – -10 °C; -10 °C – -20 °C; -20 °C and below. The warmest of these is actually the most devious, as there is moisture all around. I’ve never ridden a bike below -20 °C yet, so it remains to be seen what it brings to me. Oh yeah, and wind (both natural and one arising from high speeds) subtracts another 5 degrees from what one feels. Snow may be deep. Wider tires, lower pressures, more energetic pedaling are advised. Often it is not possible to ride an arbitrary slope, ascent, or track, as it has not been trampled down. One will have to stick to visible ski tracks, pedestrian trails, roads or sidewalks. When there is a heavy snowfall, until stuff gets cleaned from roads it is risky to ride with cars - the bike control is total whack, uncontrollable drifting is more than possible. Ice. When the weather oscillates near 0 °C, ice patches can cover roads. The practical wisdom says, whatever you attempt to do on ice to stay in the saddle, you are doomed to fall down really soon. Maybe spiked tires can assist (never tried them yet), but they are expensive and not very useful for the rest of the time. It is better to avoids ice altogether. Tourism opportunities are limited. It’s way too deep in the forest (and obviously no one cares to clean roads), and the weather is way too dangerous. A fatbike might solve the first problem, and a group of chaps carrying winter-special gear (portable heater and correspondingly suited tent) would help with the second one. Air-based suspension elements are susceptible to the law of Mendeleev-Clapeyron: pV = νRT. For the fixed amount of air and volume (true for tires and approximately holds for shock forks) the gas pressure is proportional to the absolute temperature. If one inflates his stuff to 45 psi inside a warm house (~300 °K) and then moves it to the frosty outside (~255 °K for -18 °C), the pressure will eventually drop about 15% down, to 38 psi. 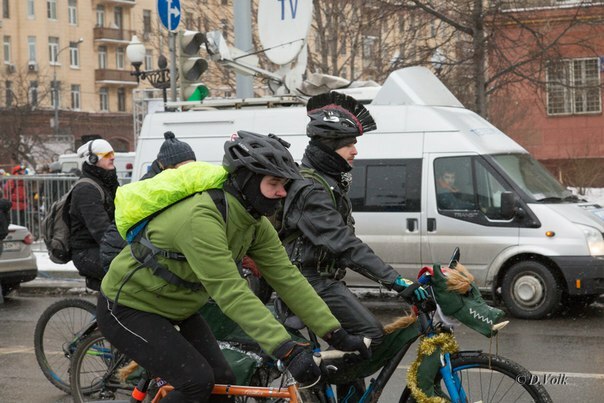 Me at the First winter bicycle parade in Moscow, January 2015. Photo by D. Volk.